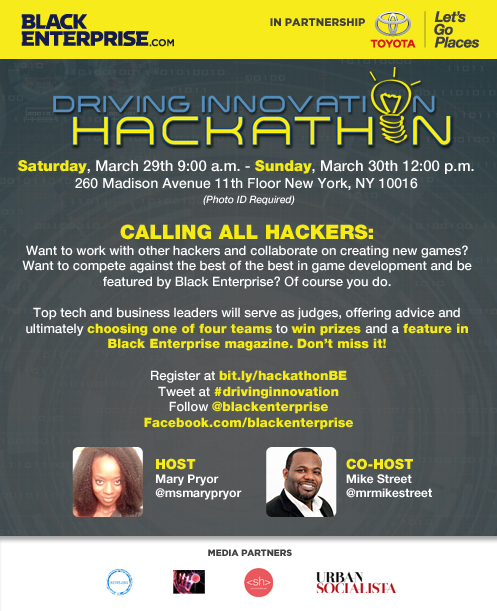 Black Enterprise will host its first Driving Innovation Hackathon presented by Toyota, where technology and creative minds will come together to build tools that demonstrate the advantages of sustainability. The Driving Innovation program was created by Black Enterprise in partnership with Toyota to shine light on African Americans in technology. 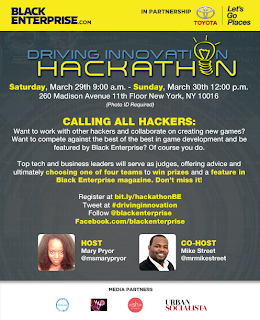 The Hackathon will take place at Black Enterprise headquarters, 260 Madison Avenue, New York, NY 10016 on March 29th -30th, 2014. The event will be open to the public from 10-2pm and 3-7pm on Saturday and 9am-noon on Sunday. Technologists, innovators and coders will form teams to design and develop their solutions. It will also be live stream at blackenterprise.com/drivinginnovation. You will be able to tune in for the full 24 hours as the hackers go head to head trying to create the best game possible.